There are over 2,000 styles of Chi Kung in China alone. Many Chi Kung practitioners believe that the style that we use today, I named (SomaMotion) was created by the Himalayan Monks around 475 AD (Soma, comes from the Greek word body). The most popular form of Chi Kung, which is the style that we patterned our program of Chi Kung from, is comprised largely of standing positions with very few, movements of the feet. These stationary exercises were originally designed to suit the needs of large numbers of monks confined to close quarters in crowed monasteries, temples, and private, nonreligious centers. Such institutions were usually extremely strict in their daily regimen, and the inhabitants often did not have enough exercise to retain good health. Further, their diet was not always sufficient. For this reason, Chi Kung exercises, sometimes called temple exercises, were developed. These proved doubly useful when monks found themselves imprisoned, not an infrequent occurrence during different periods in Chinese history. Constant practice and refinement of Chi Kung techniques began to yield a number of intriguing results, not the least of which was robust health for the monks confined to the monasteries. This was even with their lack of nutritious food. From time to time, Chi Kung practitioners also experienced profound psychological transformations, which led to superior intellectual abilities and even unusual psychic abilities such as telepathy and the ability to see auras. The monks realized that these breakthroughs were related to the Chi Kung practices themselves. They also realized that the powerful energies they were cultivating could be applied in self defense, a very useful application since in those days traveling monks were easy prey to bands of roving thieves. By observing animals in their native habitat, the monks discovered exactly how the Chi cultivated in their Chi Kung exercises might be applied in hand-to-hand- combat. Due to anatomical peculiarities, such as the long powerful wings of the crane or the extreme flexibility and constricting abilities of the snake, each animal has a unique set of movements that lend themselves well to self-defense and self-preservation in general. This gave birth to the Chinese art of Tai-Chi Chuan. The words mean “Supreme Ultimate Fist.” “Chuan” (fist) means much more than a clenched hand to a Chinese person, it means “studies and training associated with a martial art.” However, Tai-Chi, as it is generally called, is frequently used for improving and maintaining health; and now it is often referred to more as a master art rather than a martial art. ( “martial” means war) The word master art is used because when you have mastered some of the moves in Tai-Chi and Chi Kung there is a pervasiveness about this that carries over into all areas of your life. They are a discipline, providing a structure through which we can express our innermost feelings, beliefs, and ideas. It also offers a means to critique that structure and, when necessary, change it. Tai-Chi – Chi Kung are a tool for examining our roots as human beings and for exploring the potential within us. It begins with a study of the body, for it is through knowing the body that we can understand the mind. Eventually we learn to know ourselves so well that we change. Our metamorphosis is complete. It is one of body, mind and soul. In a sense, this transformation can be likened to that of the caterpillar, which incubates in a deathlike trance in the cocoon. One day, along with its skin, it sheds its wormlike form, spreads its wings, and flies off to the nearest flower to drink its nectar. Chi Kung is much better suited in the beginning for new students and Corporate America, because of the combination of deep breathing and easy fluid circular movements, making it one of the best all around exercises for all ages and fitness levels in giving its participants immediate benefits. Chi Kung is the safest and most popular form of exercise in the world. Why? Because it works! Chi Kung is not only gentle, it is very strengthening. It involves deep breathing, while moving very meditatively and slowly. Done correctly, it can offer a great cardiovascular routine for all 654 muscles. The whole body becomes oxygenated, a process which repairs and rejuvenates cells. Also, a loving and appreciative attitude is cultivated and of course, love is the greatest healer of them all! The benefits are endless. Some include here are: lowering blood pressure, lowering stress, increasing longevity, improving balance, improving concentration, lifting depressed emotions, improving circulation and losing excess weight. Chi Kung is endorsed by Arthritic, Heart and Stroke Foundations because of the many people who have improved their health with this practice. Most people (approx. 95% of adults) are shallow breathers and are so used to the fast pace of life, do not even realize that they are under tremendous amounts of stress. Most “work outs” are done close to the stress zone (using the sympathetic nervous system). Imagine, relaxing while you’re exercising! 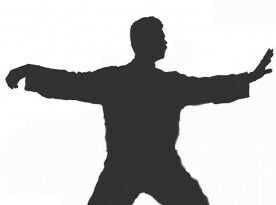 When it is combined with Tai-Chi, the combination of these two exercises can enable students to reach levels of internal and external fitness that few human being’s ever experience. The key to these two exercises, is that they are very efficient in getting oxygen to the red blood cells, and freeing the cells of blood protein blockage, which enables the cells to be free to get the oxygen and nutrition necessary for a healthy body. There are 20 moves in the Chi Kung that we teach, and can easily be taught to any beginner regardless of age and physical condition. They can also be taught to handicap individuals confined to a wheel chair or to anyone that has leg problems and has to remain seated. When teaching new students during the first 30 days, most of your lesson should be the combination of the warm up exercises and Chi Kung. Each week give them a new move from Chi Kung as their homework to practice. After a couple of weeks you can walk them through the six moves of the short form to eventually the 20 moves of the long form. After a few weeks you can sprinkle in a few simple move of Tai Chi. I want to remind you that Chi Kung should be taught before Tai-Chi when dealing with corporations and Athletes. Because it gives more immediate benefits then Tai-Chi. However in the long run, Tai-Chi brings to the student certain benefits that improve the benefits of Chi Kung. An example of such benefits are, leg strength, balance , mental focus, and mental stimulation. Chi Kung , simulates the mind, lifts the spirits, and strengthens the body. In all, it is the combination of the two arts that make the total program unbeatable in helping people reach their total genetic potential. A body charged with oxygen is a body charged with electrical energy! (Chi) But toomuch fat, like sugar and salt will rob the body of oxygen and reduce the electrical energy produced by the cells. We have learned over the period of years that our bodies run on electricity. The food we eat, if it’s the right kind of food, is converted chemically into electricity, which makes it possible for us to function. However, without oxygen, it is impossible for the cell to complete its energy cycle. Oxygen is a food for the body and is one of the most important foods we can get. Glucose plus oxygen yields ATP (adenosine tri-phosphate) which we must have to produce energy. Deep breathing saturates the blood with oxygen. These oxygen-laden red blood cells carry a negative electrical charge. Like the negative polls of two magnets, two oxygen-laden red blood cells repel each other. The blood actually moves through the body electrically. This is how and why the blood is able to go through the entire body so quickly. Three quarts of blood goes through our capillaries every sixty seconds. That is why it is better to breathe deeply five minutes a day than walking five minutes without breathing deeply. The red blood cells must travel through the tiny capillaries single file. If there are not enough charged oxygen-laden red blood cells, the red blood cells will stick together and cause a microscopic traffic jam. This blockage will dilate the tiny pores of the capillary membranes and cause “trapped” proteins in the spaces around the cells. “Trapped” blood proteins will produce excess fluid around the cells and will begin to “drown” and die because of lack of oxygen; we die from lack of oxygen at the cell level. Inside your body, you have a short-lived gas that tremendously affects your body’s function. This gas is called nitric oxide. Nitric oxide plays a fundamental role in keeping a body healthy, and the reverse is also true. In many diseases, the production of nitric oxide is impaired, and that leads to (or contributes to) cell injury or the dysfunction of organs. Nitric oxide is found in the highest levels in the nasal pharynx, and that’s why nasal deep breathing and Chi Kung are so important. The flow of air that happens when you breathe deeply through your nose allows very rich sources of nitric oxide to be fuel injected into your system. The NO then helps dilate your arteries, so that your blood keeps moving as if it’s on an empty country road rather than on an LA freeway. Major Ager: No Nitric Oxide. Too much fat in the blood stream will rob the red blood cells of their oxygen and produce the microscopic traffic jam and the resulting trapped blood proteins. When this happens in the brain, the brain cells suffer from oxygen starvation; and senility, dullness, and irritability set in. Lack of oxygen will affect other parts of the body in a similar manner, but the place where we recognize it is in the brain. You may also lose the ability to concentrate. This is why the practice of Chi Kung is so important in bringing oxygen to the cells. Whenever you bring in large amounts of oxygen into the body coupled with relaxing exercise, you are also burning “fat” at the same time that you are getting the red cells negatively charged. No exercises that we know of can accomplish this more efficiently than Tai-Chi – Chi Kung combined. Many people don’t think of the mind as being in the body. They think of the mind as being in the brain somewhere, or they don’t stop to think about where it is at all. What we have learned from Quantum physics is that the mind is in the body and controls every tissue in the body, not just the brain, as a result, every disease has a strong psychosomatic component. Neuropeptides are molecular messengers that carry messages from the brain to the rest of the body, including “soldier cells” of the immune system that circulate in our lymphatic fluid and blood stream. Through this pathway, the brain prompts soldier cells either to fight or not to fight in their war on germs, viruses or cancer cells. Put simply, how we feel and think influences our body’s ability to fend of disease. As a result, every disease has a strong psychosomatic component. Many young people in their twenties already suffer from headaches and tummy trouble, especially if they have job and family pressures. In their thirties and forties they begin to experience back or joint pain. They get a “spare tire” around the middle, their skin becomes dry and wrinkled, they feel tired all the time. One fine day, their doctor tells them they have high blood pressure or high cholesterol.. Chances are he puts them on medication, chances are the medication causes fatigue, depression, impotence, or other problems. One fine day, you wake up and you’re old. It doesn’t have to happen, in fact it should not happen. t can’t be fixed with antacids for the stomach, pain killers for back pain or headaches, waterpills for the blood pressure, moisturizers for the dry skin, crash diets for the weight problem. Hope strengthens the immune system and helps fight off disease. Research shows the lifestyle diseases can be controlled through supplements, diet, exercise and relaxation. Being in control of your life. You will most likely come across the Chinese word Qigong. It’s important to know how this relates to Chi-Kung, Tai-Chi, and Kung Fu, being that they are all interrelated. Qigong (pronounced Chi Kung) are one in the same. Qigong is made of two Chinese characters, “Qi” and “Gong”. Qi (Pronounced Chi) is the “vital energy” or “life force”. Gong has several meanings such as art, skill, work, exercise, manipulation, and self-discipline. When you combine the two into Chi-Kung, it stands for “cultivation of energy”.